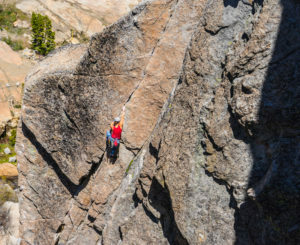 Donner Summit (located near Truckee, California) has some of the best climbing that California has to offer! There is an incredible range of options and challenges for all levels of climbers. Alpenglow offers full day and half day private rock climbing. The best part about booking a private day of climbing is that you choose your group, your location, and your dates. 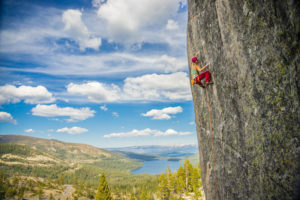 We also guide private rock climbing in the High Sierra (off hwy 395 near Bishop) as well as Lover’s Leap (off hwy 50 near South Lake Tahoe), which are also great locations but not as conveniently located to a large town like Truckee, with restaurants, hotels, and a nearby international airport. On Donner Summit we also have our weekend open enrollment or “group” courses every Saturday or Sunday. We offer Intro to Rock Climbing, Gym to Crag, Intro to Multi-Pitch, Rock Anchoring, Self Rescue, and Learn to Lead courses. All of these courses can also be taken as privates, and we can accommodate larger groups if we have enough notice. Trying something new can be intimidating, which is a great reason to hire a guide. 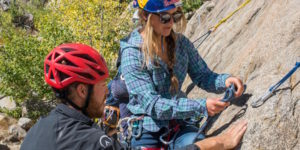 Whether you are looking to acquire new skills or to gain experience and sharpen your skills, hiring an AMGA certified rock guide is the best way to get you there! Contact us with any questions at 877-873-5376 or info@alpenglowexpeditions.com. We look forward to climbing with you soon!